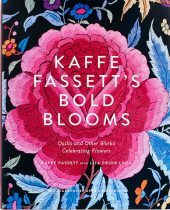 Renowned colour expert and quilt and fabric designer Kaffe Fassett explores flowers as a source of inspiration for patchwork and needlepoint in this new quilting guide and pattern collection. Along the way, he shares a behind-the-scenes look at his fascinating design process―from mood boards and “sketching” with colour swatches to planning and sewing the quilts. While the focus is on patchwork and needle­point, the design and color ideas translate to many design disciplines and materials, including crafts, fiber arts, floral design and home decor. Accessible to all skill levels, the designs on each page will inspire you to see how much more colourful and alive your needlework, quilts and creative projects can be. First published by Stewart, Tabori & Chang (Abrams, US) in 2016.